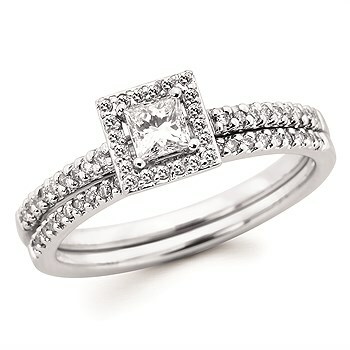 14k white gold diamond halo engagement ring and wedding band set. The Center diamond is princess cut weighing 0.20ct. Accent diamonds weigh 0.15cttw. The wedding band has a total diamond weight of 0.10ct. The total diamond weight of the set is 0.42ct. All Diamonds have a clarity grade of SI2-SI3 and a color grade of H-I. Cobalt 8MM Design Band with Rosewood Inlay.